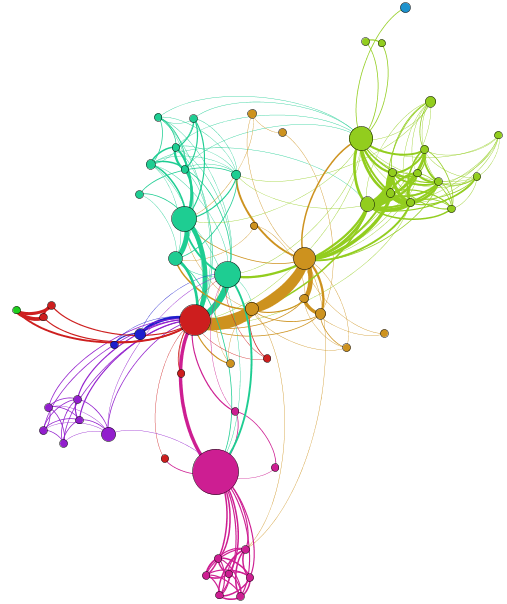 Gephi has an amazing community of passionate users and developers. In the past few years, they have been very dedicated creating tutorials, developing new plugins or helping out on GitHub. They also have been patiently waiting for a new Gephi release! Today we’re happy to share with you that the wait will come to an end December 20th with the release of Gephi 0.9 for Windows, MacOS X and Linux. We’re very excited about this upcoming release and developers are hard at work to deliver its roadmap before the end of 2015. This release will resolve a serie of compatibility issues as well as improve features and performance. Our vision for Gephi remains focused on a few fundamentals, which were already outlined in our Manifesto back in 2009. Gephi should be a software for everyone, powerful yet easy to learn. In many ways, we still have the impression that we’ve only scratched the surface and want to continue to focus on making each module of Gephi better. As part of this release, we’ve undertaken one of the most difficult project we’ve worked on and completely rewrote the core of Gephi. Although not very visible for the end-user, this brings new capabilities, better performance and a level of code quality we can be proud of. This ensure a very solid foundation for the future of this software and paves the way for a future 1.0 version. Below is an overview of the new features and improvements the 0.9 version will bring. This release will restore Gephi’s compatibility with the latest Java versions on all platforms. This will resolve issues our users encounter with Java 7 and 8. Compatibility issues with Mac OS will also be resolved and full support for Retina display screens added. This release will improve performance and reliability by a large margin. The graph structure at Gephi’s core has been redeveloped from scratch and will bring multiple new features, better performance and lower memory consumption. On benchmarks, simple operations such as reading nodes or setting attributes see performance improvements ranging from 2X to 100X. This new core will make many operations in Gephi faster and push the envelope even further in large graphs exploration. Reducing memory usage has also been an area of focus and we have measured a 2X reduction compared to Gephi 0.8.2 on a medium-size graph. We’re introducing a new user module named Appearance designed to combine and replace Ranking and Partition modules. Appearance will group in one place all controls acting on the node or edge appearance. 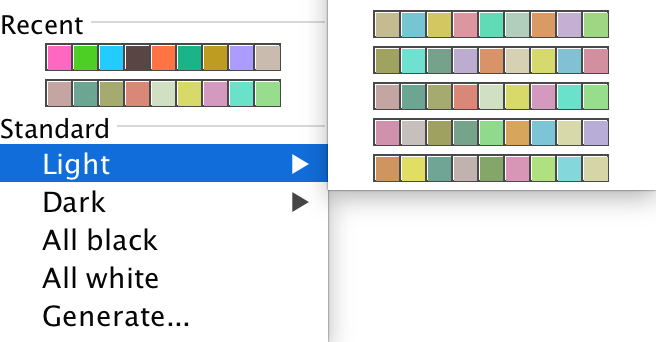 The partition capabilities will also greatly improve as part of this new module and a new palette selector is being added. 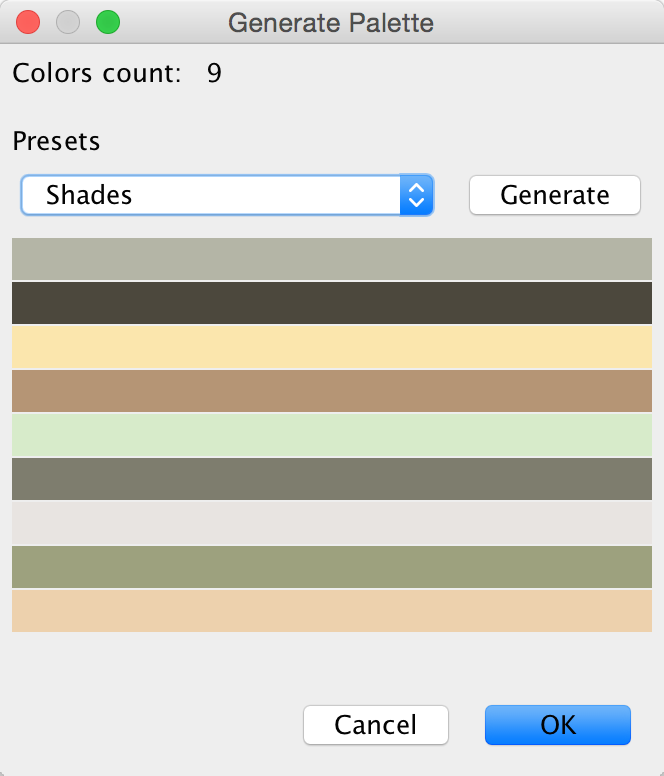 In addition of the default palettes, we’re also adding a cool palette generator designed to find the optimal colors (i.e. partitions can be differentiated from each other). Moreover, it will be possible to “Auto-apply” partitions as well, which is a feature that was only available for Ranking so far. This 0.9 release adds a new way to represent networks over time: timestamps. So far, users could only represent time using intervals and that was cumbersome when the underlying network data was collected at fixed time intervals (e.g. one network per day). Starting with this release, Gephi will support both intervals and timestamps to represent evolving network topology and/or evolving attribute values. The GEXF format is also evolving to its 1.3 version. This version improves the support for graphs over time and introduces the ability to represent time using timestamps rather than intervals. In addition, it’s now possible to set a timestamp or an interval for the entire graph, allowing building collections of GEXF files where each represents a “slice”. This is a common request from the community and we hope this will greatly facilitate the exploration of longitudinal networks. With the 0.9 version users will be able to import multiple files in Gephi at the same time. 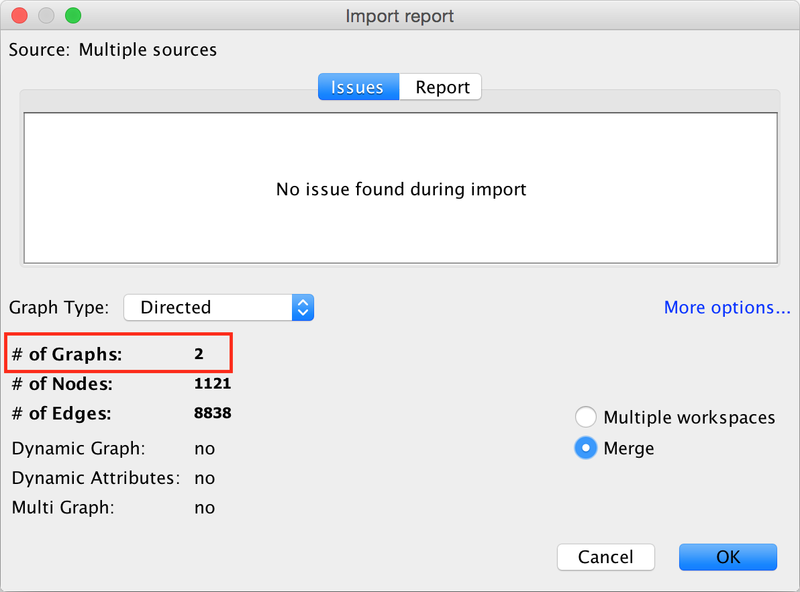 Once the files have been read, two choices are offered, either to import each file into a separate workspace or merge them into the same workspace. The latter is a powerful option when used with dynamic graphs. Indeed, a collection of GEXF files representing the same network over time will be imported in Gephi in a single step. This release will bring support for multi-graphs, where multiple edges can exist between two nodes each with a different relationship. Users will be able to import, filter and run algorithms on these graphs but the support for visualizing these graphs will come in a further release. We’ve heard users’ feedback and the workspace selection user interface will be improved. The new interface will be a “tab-style” interface where each workspace is a tab and switching from one workspace to another only requires a single click. Tabs will be located at the top just under the perspective selection. The previous interface is located at the bottom right corner and will be entirely removed. A new release of the Gephi Toolkit, based on the 0.9 version will be made soon after December 20th. We’ve done a serious bug squash and already addressed many difficult issues, more to come until the release date. Follow us on Twitter or join the Facebook group to get the latest news. If you want to know more about this upcoming release, or want to help out please send us a note. Gephi has been almost inactive since quite a long time: we did not release, we did not fix issues, we did not post on the blog. This lack of recent updates creates an increasing amount of difficulties, including installing Gephi on a recent Mac computer. A lot of users ask if the project is still alive. We understand why you wonder and decided to write this post to explain where we’re at and provide to the community a preview of what’s next in Gephi’s lifecycle. In short, Gephi is still alive yet asleep, but its reawakening is in sight. However, a series of issues prevents us from doing better right now. The next planned release is Gephi 0.9 and promises to be a major release with a complete rewrite of Gephi’s core module. Performance, and especially memory usage for large graphs has been a lingering issue since the first version of the software. As explained in this article written by Mathieu Bastian – Gephi’s lead developer – the solution resides in a more efficient graph structure implementation that we named “GraphStore”. This technology brings many new features and significantly reduces the memory usage but is a large development effort and requires all modules to be adapted. 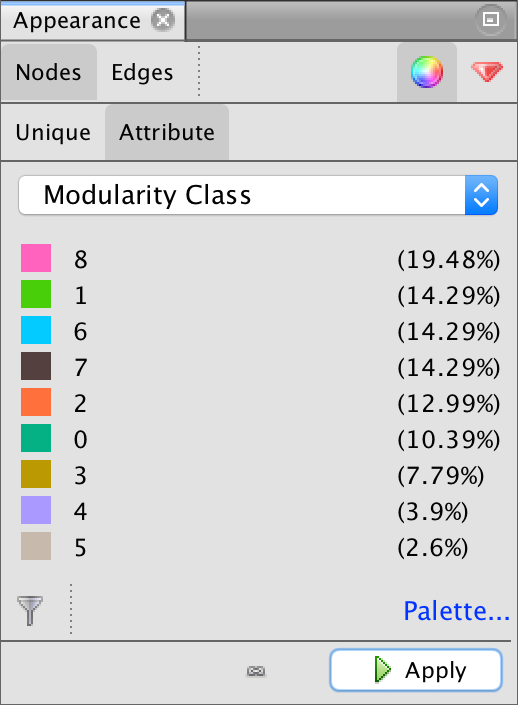 Indeed, the module which stores and manages the graph is pretty much used by every other module (e.g layout, filters, preview etc.). This work on the core graph module was initiated as part of a larger vision focused towards a 1.0 release, which aims to address a much larger set of problems, missing measures and bugs. As you may know, the current version has a various set of problems. Some issues are preventing the normal use of the software, like the difficulties to install it on a recent Mac OS X (Yosemite and Maverick). Others are incomplete or missing features, such as various user interface design issues or the improper management of categories’ colors. Finally, some internal problems are hidden in the code but nevertheless real. For example, the technology used to code the user interface (Swing) has been replaced by a more modern technology named JavaFX. For the most part, these problems require a deep rework of the code. The good news is that the most difficult part in this 1.0 vision is probably the rewriting of Gephi’s core graph module, which is what the 0.9 version focus on already. The current 0.9 developments have reached around 80% completion and many modules, but not all, have already been adapted to GraphStore. A stable version can’t be released until this reaches 100% and all the modules are converted to the new core implementation. Other important issues such as installation issues on recent Macs have already been addressed in this development version. Finally, a series of bugs will be fixed along with minor features and improvements. Finishing the last modules and releasing the 0.9 version is our current priority. Like many other open source projects, Gephi’s development is for the most part unpaid and remains an activity on the side for all contributors. The notable exception is the Google Summer of Code, which sponsored students multiple years in a row to work on the project. Therefore, the project’s progress depends on the contributors’ professional and personal situations. Although individuals are ready and willing, time is limited and there was just not enough of it lately to make significant progress. Mathieu Bastian is Gephi’s architect and has been behind the software’s key iterations since 2007. This time again he holds the keys to its future and has been involved in the GraphStore project. This complex project requires all of his knowledge of Gephi’s code and is hardly a task someone else could do at this point. Therefore, a part of our development depends on his free time, and we accept it. This situation is temporary though. Indeed, Mathieu will eventually obtain more time to conclude the work on the 0.9 release and Gephi’s development will be less dependent on him in the future. In addition, we are working on stabilizing some resources in the long run, but our strategy requires a readjustment. Gephi needs time and energy from good java developers, clear-minded designers, and seasoned software architects. We have to entice skilled people, support their involvement and get the best from their contributions. We aim to improve the management of our limited workforce to make the development more attractive and dynamic. This evolution is organized by our team but benefits from external support. For instance, the Sciences Po médialab, the institution I belong to, provides resources for organizing the project, rethinking the user interface and some coding. These changes may not be immediately visible but we’re committed for the medium and long term. Releasing the Gephi 0.9 version is the immediate next step. This version will include compatibility fixes and the whole new core based on GraphStore. Then, an important project to rework the overall user experience will be kicked off. It requires a technology switch (from Swing to JavaFX) and the overhaul of a majority of the modules but aims to make Gephi simpler and more intuitive to use. We already have a good diagnostic of the user experience issues in Gephi but need to explore different designs. In an upcoming blog post, I will explain our thought process on this topic with the help of Professore Donato Ricci, senior interaction designer. Eventually, the 1.0 version will be worked on and released. Gephi is almost 10 years old. It is usable but still plagued with many well-known issues. Though sometimes frustrating, it allows users to do incredible things. 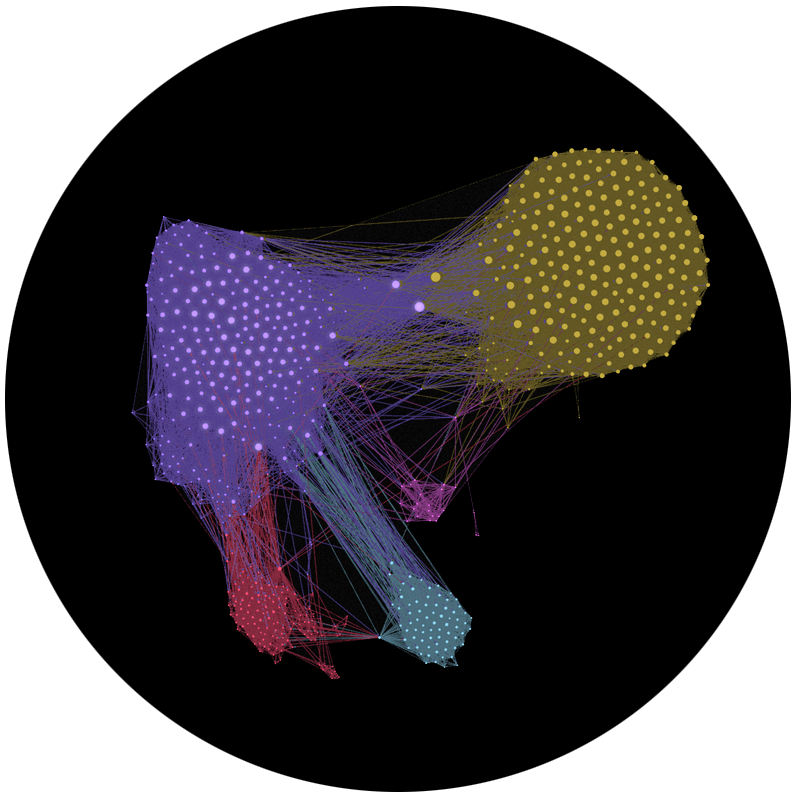 We think Gephi is still relevant to research, journalism, civil society and more. We are going to give it the renewal it deserves.